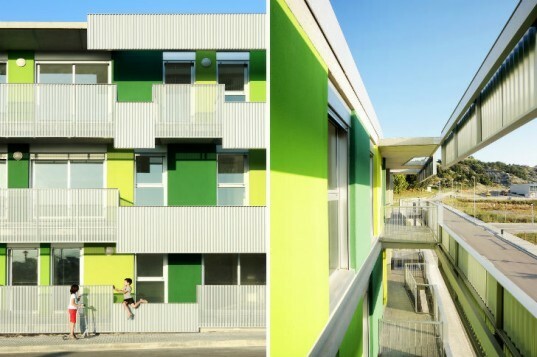 The colorful Santa Eugenia de Berga Social Housing project in Spain presented an interesting challenge to Barcelona-based design firm Bailo Rull ADD+: to design an efficient building despite the site's unfortunate solar orientation. Located between an existing building and open green space, the site for the project was along the north-south axis that had zero shade on the west. In order to keep the building from cooking in the afternoon sun, the firm's solution was to add a brise soleil handrail to filter the light and block the heat. When Bailo Rull ADD+ took on this project, one of the main problems they had to solve was how to design a social housing project with a misguided solar orientation? The masterplan called for a linear volume of 14m depth and 60m length on a north-south axis. The site was located at the edge of the city on the last block overlooking a green area to the west with an existing building to the east. This means that no morning sun reached the building, but it received the full afternoon sun. The firm couldn’t very well change the lot’s orientation, so they had to work with it and come up with a solution to keep the building from overheating. The firm came up with a workaround solution that would block the afternoon sun, but at the same time provide a visual connection from each apartment to the green space across the street. They designed a brise soleil handrail on the west side set 2 meters away from the building by private deck space. Made with perforated aluminum panels, the brise soleil blocks the summer sun from entering the apartments, but is spaced to allow winter sun to reach in. A careful analysis and design of the west facade ensures that all the apartments still have views and natural daylighting, but won’t be cooked by the sun. It certainly does not look like a social housing project, more like a design house! So congratulations on that. My only question would be how sustainable the materials would be, as one could imagine that tear might be slightly higher with people moving in and out more frequently? 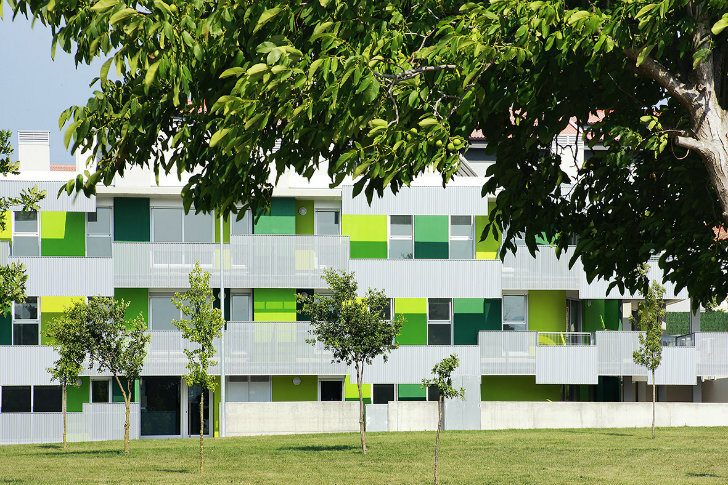 When Bailo Rull ADD+ took on this project, one of the main problems they had to solve was: how to design a social housing project with a misguided solar orientation? The masterplan called for a linear volume of 14m depth and 60m length on a north-south axis. The site was located at the edge of the city on the last block overlooking a green area to the west with an existing building to the east. This means that no morning sun reached the building, but it received the full afternoon sun. The firm couldn't very well change the lot's orientation, so they had to work with it and come up with a solution to keep the building from overheating. The firm came up with a workaround solution that would block the afternoon sun, but at the same time provide a visual connection from each apartment to the green space across the street. They designed a brise soleil handrail on the west side set 2 meters away from the building by private deck space. Made with perforated aluminum panels, the brise soleil blocks the summer sun from entering the apartments, but is spaced to allow winter sun to reach in. A careful analysis and design of the west facade ensures that all the apartments still have views and natural daylighting, but won't be cooked by the sun. Cross section showing solar gain from the west. Site plan and the building's relationship to its surroundings and the sun. Perspective of a resident on their porch.